Although I don't pay for heat at my apartment my girlfriend and I like it a little colder when we sleep and cant get out of bed in the morning when its cold. I also needed a project for my new 3D printer. 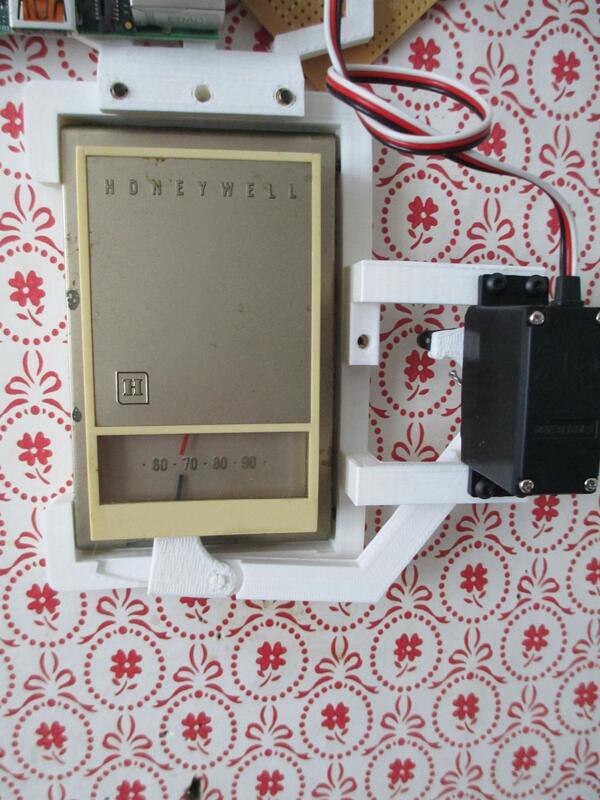 So I decided to make a device that controls the thermostat based on time. First I had to come up with some logic to determine the desired temperature as a function of time of day. I though depending on how cold the apartment was would determine how early the heat come on. Then I realized I was just controlling the thermostat set point so all it needs to do is ramp up (at a reasonable rate, yet to be determined scientifically). 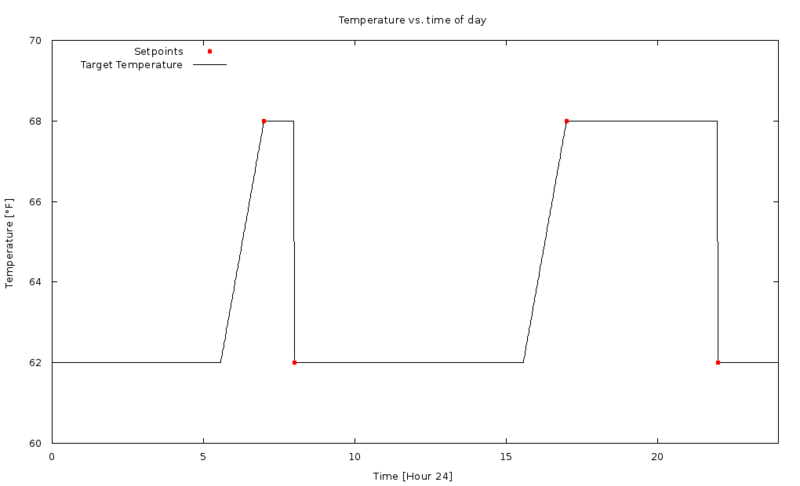 So I wrote a C function that takes set points shown as red dots, and determines the temperature at any time. A raspberry pi with a wifi dongle is the heart of this device keeping time and determining set temperature (in the future it could be web enabled and I could get serious control). The time and temperature are sent to a Microview which controls the servo motor and displays the set temperature. The servo motor is linked to the thermostat lever like a 4 bar linkage; it can control the temperature from 60-90 deg F with 0.5F resolution. I haven't programed weekends or if work scheduled are different yet, so I just included some over ride buttons, that let the user select the temperature manually. It will stay at the new temperature for 2 hours then go back the the time based temperature. The code is not very efficient of readable so I'm omitting it. Interesting example of a relatively simple project that demonstrates 3D printing, Raspberry Pi and servo motor application. 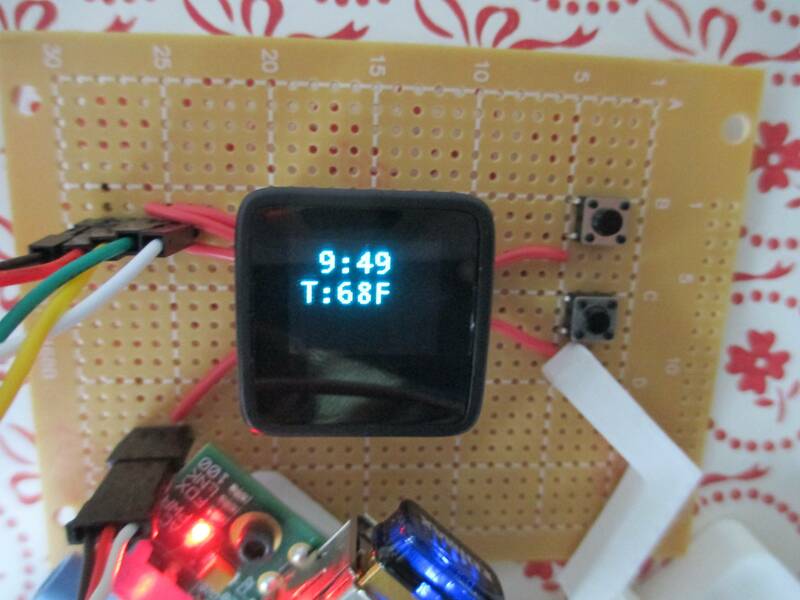 That is by far the most unique and unexpected approach to a programmable thermometer I have ever seen. Generally programmable thermostats would replace the control switch with a MOSFET or SCR, replace the thermometer with a digital temperature sensor, and completely remove the manual temperature setting lever by using a few push buttons and a digital display to allow the unit to be programmed or to set the desired temperature to be maintained. Your old school/high tech hybrid and the open layout with no case would certainly be a conversations starter, around my house.